400 pages | 2 B/W Illus. The use of drugs as remedies for various types of diseases has a long tradition; however, it has only been recently recognized that the value of any given compound must be evaluated in light of its benefit to risk ratio. When prescribing drugs, physicians must look at the big picture of the drug's benefits in relation to its side effects and possible toxicity. The aim of this handbook is to compile data from various authors, providing clinicians with data that will optimize their decision making in selecting effective, low-risk drug treatments. It also provides research workers, including physicians, pharmacists, and basic scientists, with a sound basis for increasing knowledge of the risk/benefit ratios of various drugs. 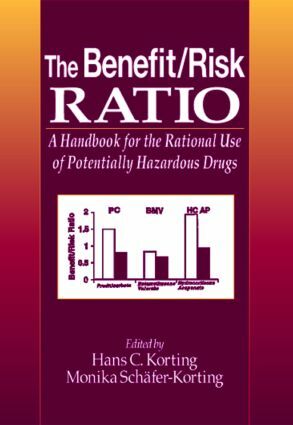 "This book appears to be one of the first to examine risk and benefits of new drugs in a more quantitative manner…this book provides a solid overview of drug types and their benefit/risk ratio…This resource would compliment the collection of most health science libraries…Of special interest to those involved with drug development and pharmacology and therapeutics."